Like many roles in life I think when art is what you do or the way you make your living – you are the forever student. I will never know everything (not even close!) And more importantly I always wish to be growing, expanding and pushing myself to learn. So with that in mind I decided to take a couple of week-long classes this year and I very hope to be able to do this every year if I can. Last year it was Barcelona – this year my old home city of Edinburgh. I had looked at Summer School classes at Edinburgh College of Art where I gained my degree in Performance Costume many years ago – but – well, the classes are not as varied as they used to be. 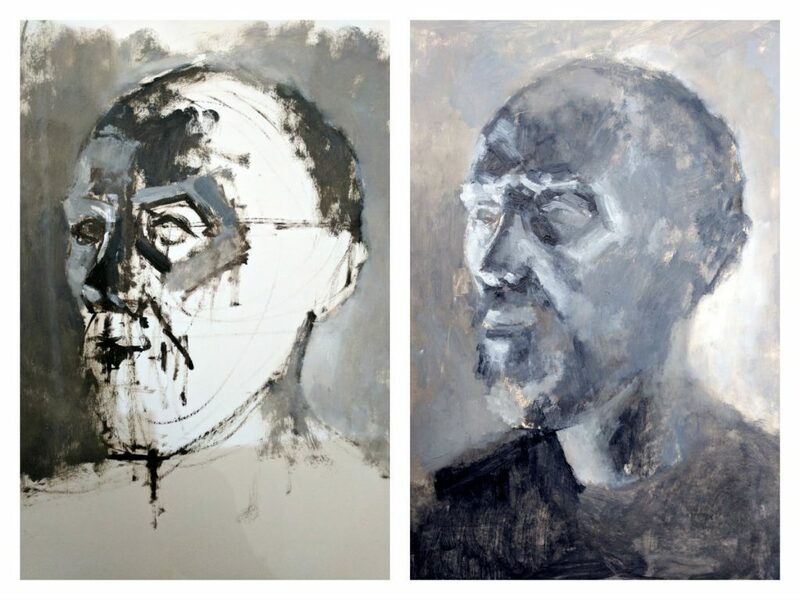 At Leith School of Art there is an incredible range and with no idea of how to narrow it down I eventually chose a week-long course in Painting the Head with Sarah Gittins. I was very tempted to go for a landscape course – but as that is my main focus at the moment in my own work I thought it would be good to have a contrast. I don’t get access to working with a life model very often so that was a big plus too. There is always so much to learn from portraits that can be applied to any subject matter so I went into this week with an eagerness to explore and work beyond my own limitations as best as I could. Sarah Gittins is a painter and print-maker based in Edinburgh and there is a real focus on drawing in her work which focuses on ‘landscape, people and happenings’. 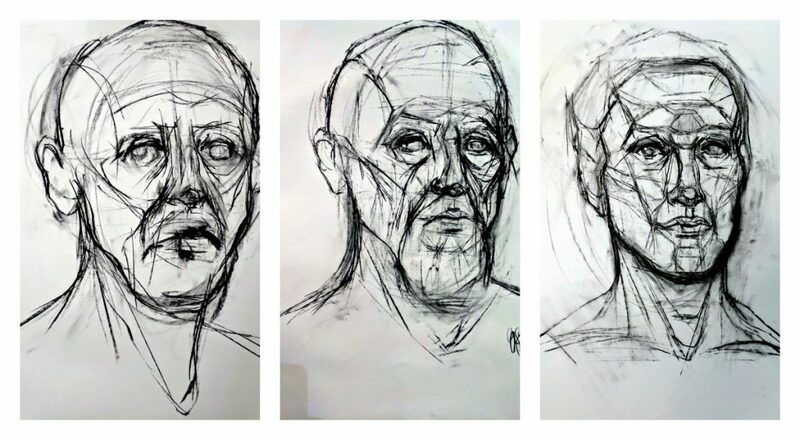 The Painting the Head course had a strong foundation of drawing and building on line, anatomy, proportion, shadows and light – gradually building towards a final painting of our life model. Whilst these are the foundations of my portraiture work previous to this course – there is of course always more to learn and practice. We had 5 different life models to work from over the week (2 each day over the course of 5 days) and the course was so well structured and organised that one day flowed easily into the next. Exploring proportions and anatomy with the focus on the large muscle groups of the head (excuse the shadows). These were quick ten minute drawings with the muscle groups drawn over. 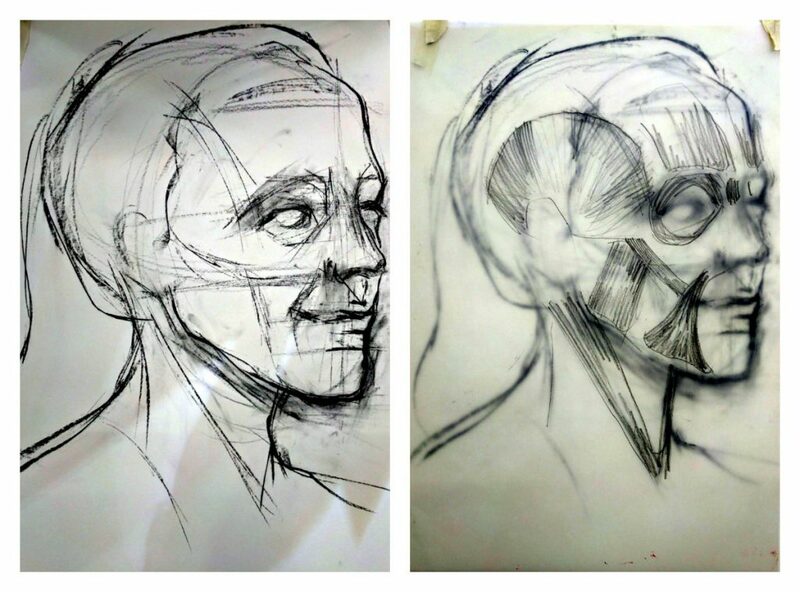 So valuable for learning how the main forms and structures of the head and face work together. 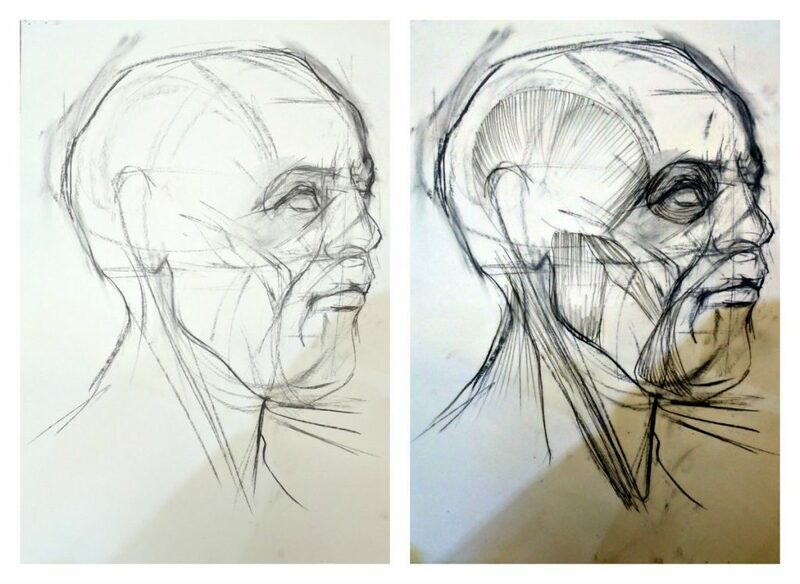 The first day was all about line and building the foundations of the head – it was a pretty intense day with lots of quick drawings that explored proportions and anatomy. I think we did 13 drawings by the end of day one! Working on proportions and building up the planes of the face with line it was a real exercise in exploring the contours of the face that bring realism and depth rather than creating a bland mask. No smooth surfaces here – it was all about depicting the way muscles and skin lie over and hang from the bones – I could have worked on these exercises for days! 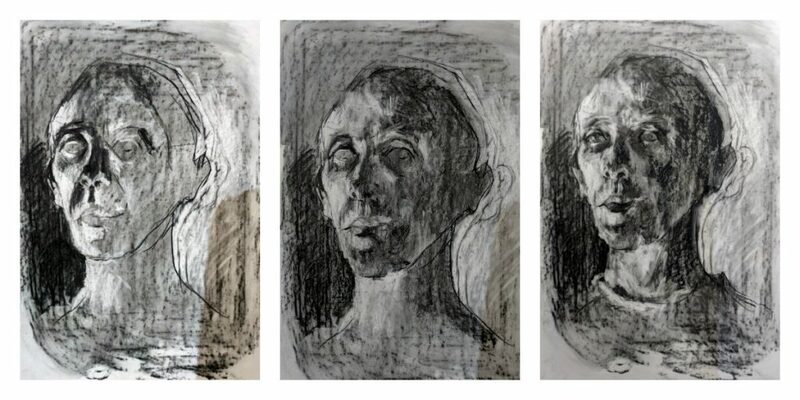 Here we were building the planes of the face – the larger and smaller shifts in form and the challenge was to create them with line rather than shadow and light. Day two and we were delving into shadows and light – something that is already so key to my way of understanding the face. But there is nothing like working from life models. Extreme lighting, a living breathing human in front of you and the challenges of movement and shifting light. I truly wish I could work from a life model all the time. This drawing is pretty big at around 24 x 33 inches – my favourite scale to work at for charcoal drawings. I don’t believe in mistakes when drawing – I think it is more a case of exploring form with many lines until one of them is the one you want! But the rest are left to add energy and flow to the piece as a whole. This was a relatively quick study of shadow and light in monochrome – perhaps an hour and a half and again is around 24 x 33 inches. 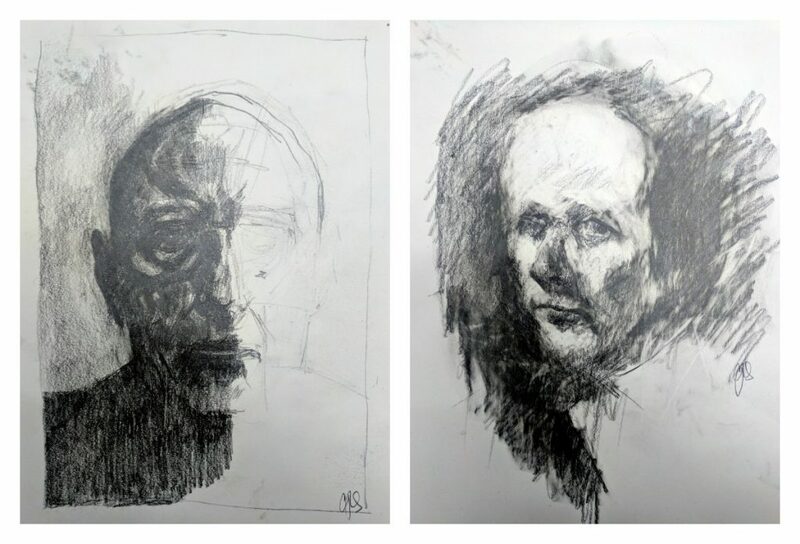 Pencil on paper sketches – first from a self-portrait etching by Ken Currie – then from the painting The Oncologists by the same artist. Our third day we spent half the day at the Scottish National Portrait Gallery in their modern portrait rooms. It is such a valuable exercise to sketch in galleries from the paintings and sculptures and I have done so many times. Here we were exploring the way the artist has used the shadow and light, realism or expression, composition and mark making. I ended up choosing 2 pieces by Ken Currie – the first a self-portrait etching which was quite small and the second is a study of a part of his much larger painting The Oncologists. It is fascinating to see how an artist uses different mediums in their work – on first glance they appear completely different in style and aesthetic however sketching from them allows us to understand the way the light is used, the forms are built up and here there is a really strong sense of shadow and light with a sense of realism but a great deal of expression. I have not always been overly fond of his work but sitting in front of each piece for at least an hour brings a new appreciation. 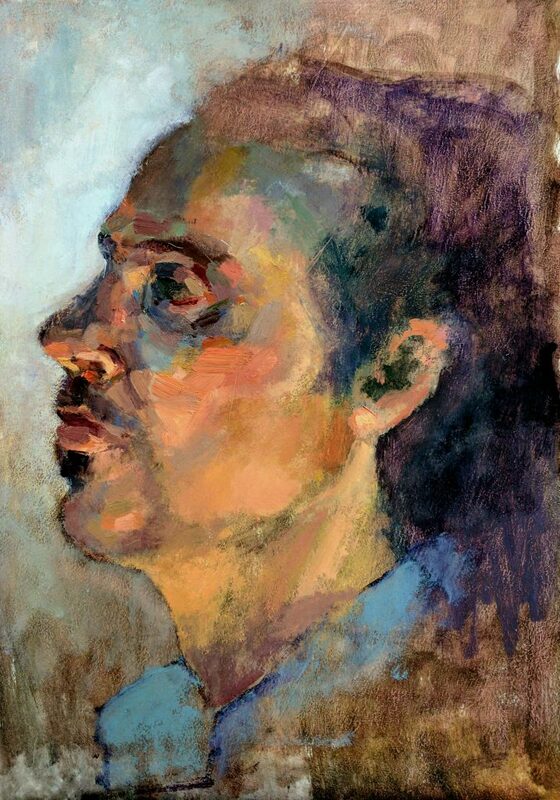 We often take relatively short moments with an art work – whether it be from a book or in a gallery – perhaps taking a minute or two to briefly study the expression of a portrait or the colours or the mood or subject. But sitting for an extended period of time – observing, drawing, studying – really looking and spending time with a work of art – we can make new discoveries and feeler a deeper connection to that which is in front of us. After an exercise in painting with colour on day three we were ready to delve into painting a sustained portrait from one pose for the last two days of the week. Unfortunately I had a bit of an erratic two days – first being unwell which meant I missed the whole of the morning on Thursday and then my car breaking down (on a roundabout!) on the final day meaning I again did not get to the college till lunchtime. Still, these mishaps put me in the position of just wanting to get as much done as I possibly could in the short time I had and I frantically mixed colours and just went for it in getting my painting to a place where I was as happy as I could be! No hanging about procrastinating here. We were using a very limited palette of cadmium yellow, alizarin crimson, ultramarine blue and titanium white. No fancy oil mediums – just odourless mineral spirits and painting on primed board. That is a great lesson for me! When I am teaching it is often hard to limit the materials as you want to bring as much value to a course as you can and there is a misconception that more materials, more lessons, more, more, more equals great value. But here – we had the simplest of materials and colours and yet I learned so much. I can’t over emphasise how much I learned from this! It is certainly something I will be taking forward into my own teaching. I mixed up an extensive palette with my few colours (I wish I had taken a photograph of my colour palette) and over the two days (well, two half days really) I just worked so hard to create a dynamic portrait that focused on form, light, the changing colours over the skin and getting a real feel for the way the forms of the face respond to the solid underlying structures of the skull and the movement of the muscles that hang from the sold forms. Considering my limited time I am pretty pleased with the result and again, I learned so much. 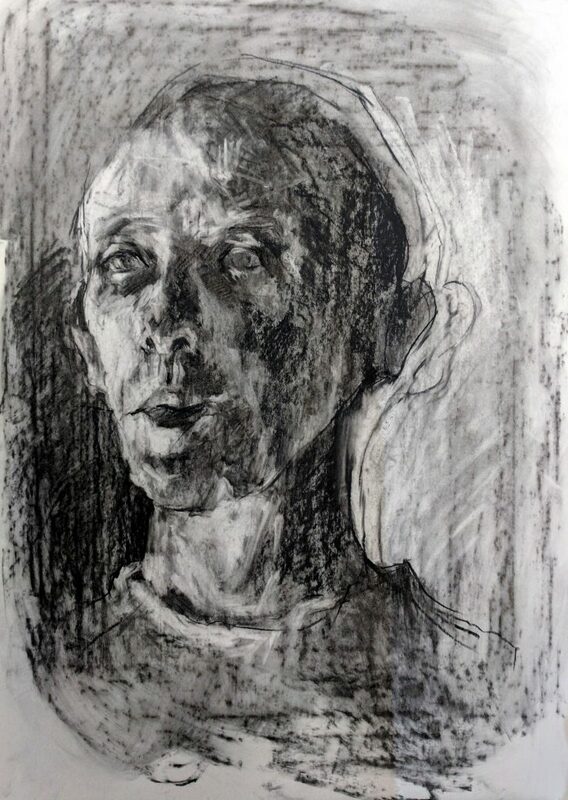 I see now looking at the in progress images that I turned the models head between image three and four – but again that is the challenge and joy of working from a real living, breathing person. Looking at the final image there are many things I would change or rework – but that is the joy of creating art. There is never a final piece. I read somewhere recently (I can’t remember where) – that a painting is never finished. It is merely the beginning of your next painting. This is something I have always believed although I could not have put it into words. So when I read this it hit me right between the eyes! There is no such thing for me as a finished painting that does and says everything I want it to – each piece is merely the preparation for the next piece. That is an incredible thing to know and understand – it means there will always be struggles and challenges – but ultimately it is these things that keep us coming back for more. Each piece raises more questions than answers – that is what energises us for the next painting. I am so glad I booked on this course. 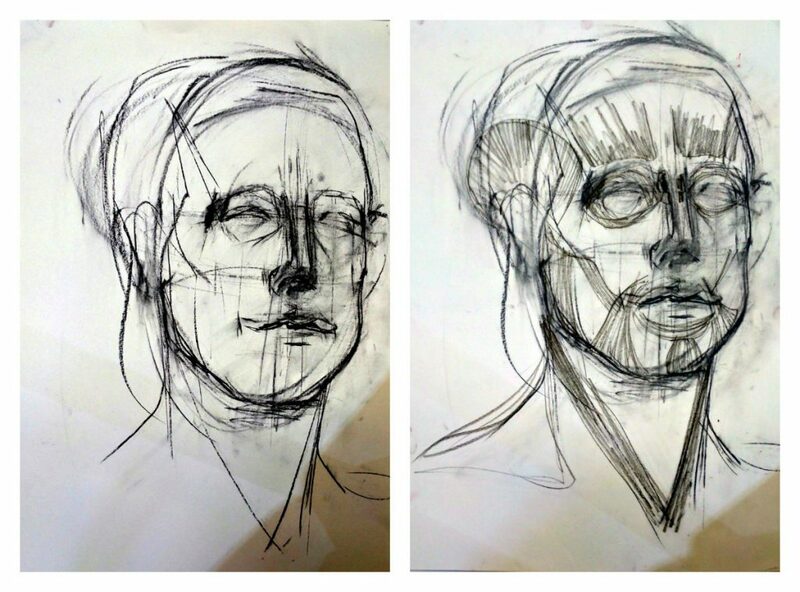 I am at Leith School of Art again in a couple of weeks for a Figure painting course and I am so looking forward to it. I aim to make this an annual gift to myself – a couple of courses that keep me learning and growing and challenge me in my own practice. If you have enjoyed this post and are interested in learning with me in real life then I just wanted to draw your attention to a course I am teaching in North Carolina in October of this year. The first week in oils has sold out however there are only a couple of places on the second week where we will be working from a life model and working in acrylics (but adding mediums to replicate the feeling of working with oils without the smell ; ) You can read more on my Art School site here and email Jane at Random Arts for registration details. If you have any questions please don’t hesitate to ask. My good friend Kathie Vezzani wrote the most wonderful blog post about out recent weeks together in Seattle, Portland and Amsterdam and you can read more here. We are announcing more trips for 2018 very soon so stay tuned! Oh my, Gillian. I loved reading about your journey in this class. I can’t wait to see how you incorporate some of these lessons into your own teaching. I know it will deepen the experience for all who take a class from you. Well done. I found some of your powerful artwork on Pinterest, somehow that led me here. It was really interesting reading about your journey and that there is always more to learn even if you are already super-talented. The last portrait is wonderful. I’m going to take a class from you as soon as I can. Rachel thank you so much for your lovely comments. It is amazing the breadcrumbs that lead us to discovering artists. I think it is more hard work than any form of talent and I know that I am always, always learning. Thanks again and I hope you can join me in creating art in the future!